The via Appia Antica is the old Roman Appian Way, which ran from Rome down to Brindisi, three hundred kilometers to the south. The stretch close to Rome is now part of a nature and archaeological park which includes early Christian catacombs, original Roman causeways, monuments and mausoleums, the remains of seven Roman aqueducts dating back to the Republican and Imperial age, and large, untouched rural landscapes dotted with cypress and maritime pines. 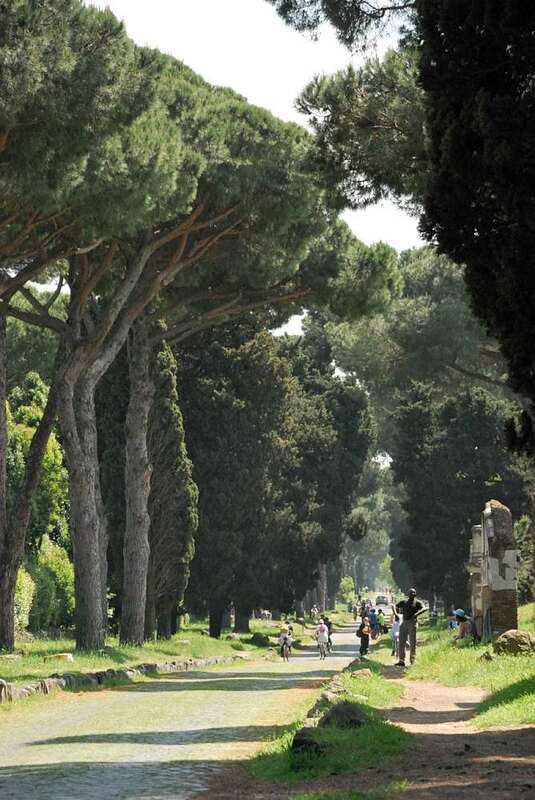 Walking or riding a bike along the Via Appia Antica is a refreshing change from the city, particularly on Sundays when the area is closed to traffic. The road is attractive and atmospheric, with plenty of grassy spots where to relax and to picnic. You could easily spend a whole day here (the complete itinerary is more than 30 Km long! 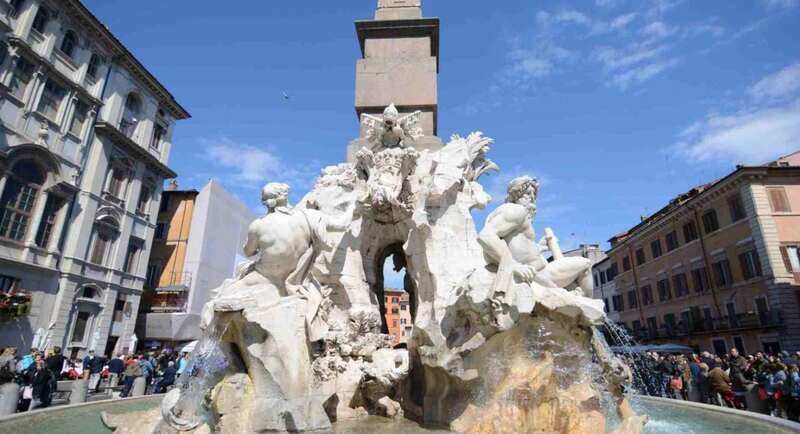 ), but with so much else to see in Rome most visitors spend there just two hours or less. 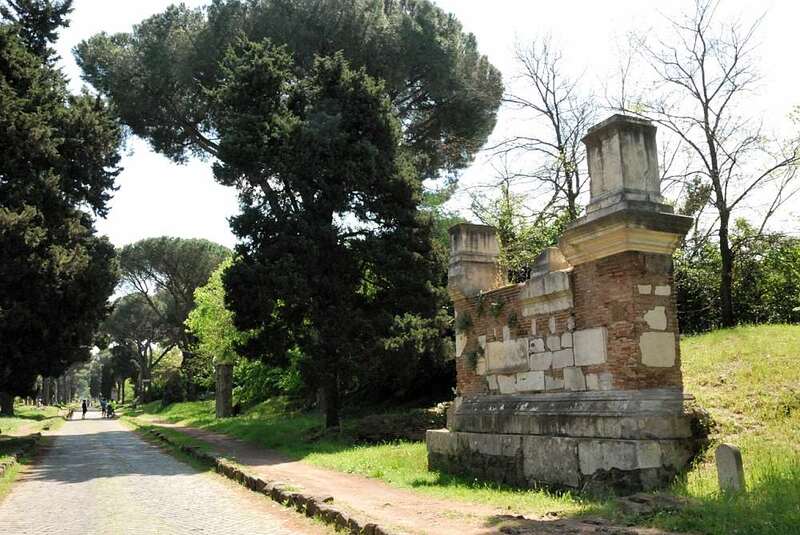 The Appian Way can also be the convenient visited with the hop on-hop off buses. 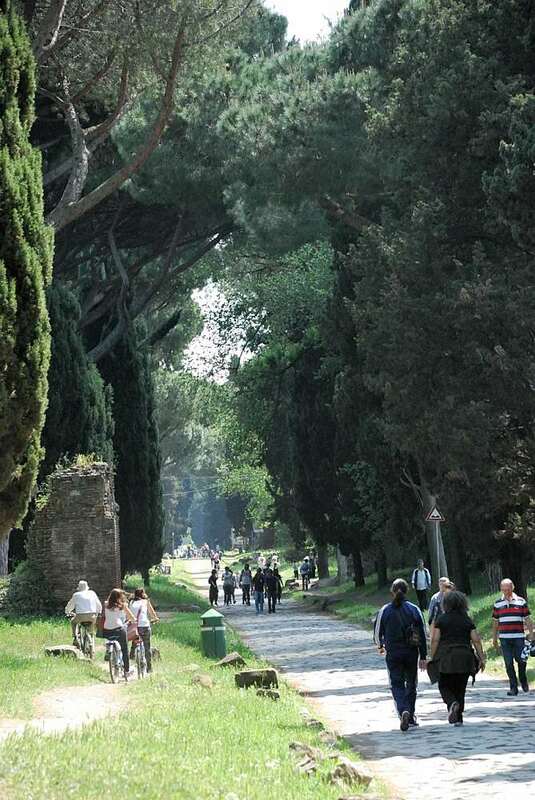 For bicycle fans wanting to plunge into nature the Appian Way park is the ideal place for a full-immersion experience. After renting your bikes at the Park headquarters, not too far from the imposing Porta di San Sebastiano (one of the mane gates in the Aurelian walls) head to the Catacombs of St Callisto following a causeway bordered by rows of cypresses. The catacombs of St. Callixtus are among the greatest and most important of Rome. They originated in the middle of the second century and are part of a cemetery complex which occupies an area of 90 acres, with a network of galleries about 12 miles long, in four levels, more than twenty meters deep. There were buried tens of martyrs, 16 popes and thousands of Christians. Passing through imposing galleries full of loculi, we reach five small chambers, truly family tombs, commonly known as the cubicles of the Sacraments, and particularly important for their frescoes. Keeping cycling on the Appian Way, you will shortly see, on your right, the basilica of Saint Sebastian. Built at the beginning of the IV century but rebuilt in the XVII century, it was dedicated to the martyr buried in the adjacent catacombs to which access is besides the church. San Sebastiano Catacombs are smaller than San Callisto’s, but host some really impressive underground mausoleums. Some two hundred metres after San Sebastiano, on the left, you will find the ruins of the imperial residence of Maxentius, which includes the 250 metres long and 92 metres wide circus. The stadium steps could accommodated 10,000 spectators. Immediately thereafter stands the Tomb of Cecilia Metella, erected shortly after 50 B.C. The cylinder shaped mausoleum, faced with travertine marble and crowned with a marble frieze, has an impressive size of 11 metres high for 29.50 metres in diameter. Today, the Ghibelline battlements form part of a medieval supra-elevation while the tomb was transformed into a tower and included in a fortified quadrilateral that comprised the Appian Way. At the beginning of the XIV century, it was incorporated in the Castello dei Caetani, which also comprised the Palazzo, built against the tomb. If you’re hungry or thursty, the nice Appia Antica café, just besides Cecilia Metella mausoleum, will offer you a fresh inside garden and simple traditional dishes, as well as sandwiches and beverages. You can also rent bikes here, in case you arrived by foot or with the Archeobus, which stops just in front of it. From now on, the road finally runs freely flanked by pine and cypress trees with numerous remains of tombs and huge portions of Roman causeway. It’s pure beauty and amazement! Up to you to decide how long you want to cycle and explore. You will find plenty of ancient statues, monuments and tombs along the way, partially rebuild in the last century. When you get tired or out of time, just turn your bike and go back along the same way. • Museum of the Walls – Via di Porta San Sebastiano, 18 – ph. 0670475284. Daily 9.00 a.m. to 2.00 p.m. Monday closed. • Catacombs of St. Callisto – Via Appia Antica, 110 – ph. 0651301580. Daily 9.00-12.00 a.m.; 2.00-5.00 p.m.; summertime until 5.30 p.m.
Closed on Wednesdays and in February. Admission € 6,00. • Catacombs of St. Sebastian – Via Appia Antica, 136 – ph. 067850350. Closed on Sundays and from November 10th to December 10th. 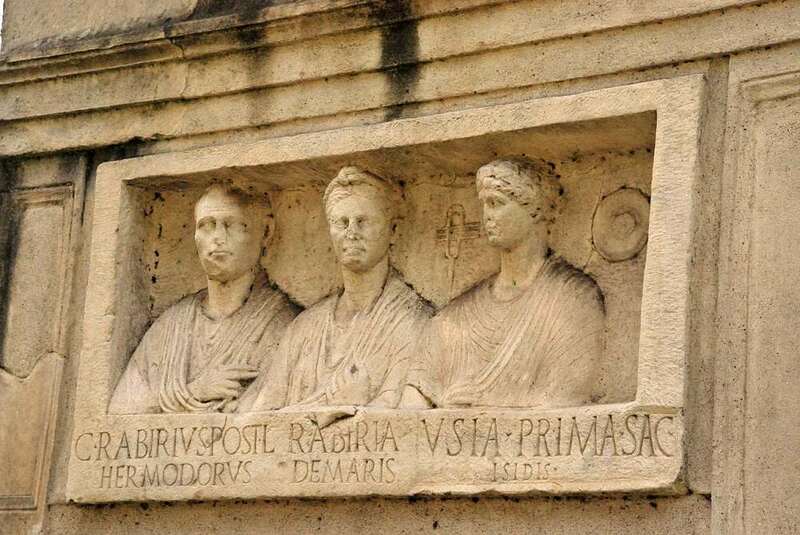 only request: Soprintendenza Archeologica di Roma – fax 0648900740. 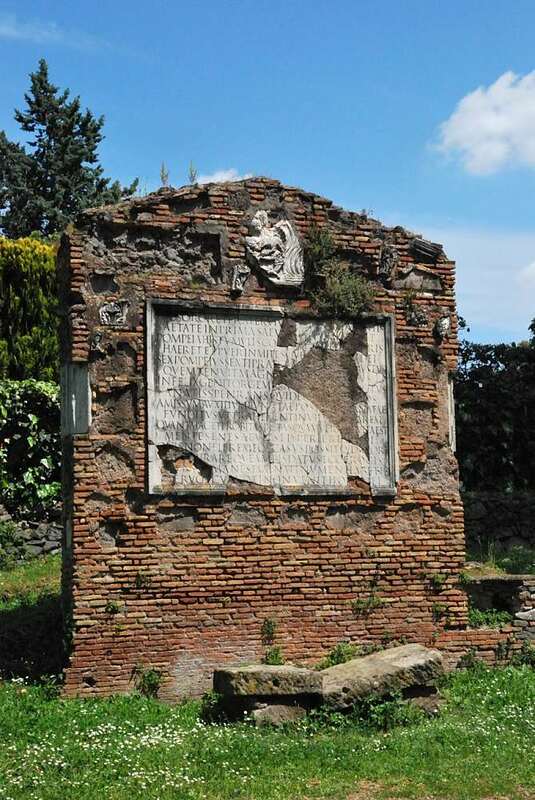 • Tomb of Cecilia Metella – Via Appia Antica, 161 – ph. 0639967700. Daily 9.00 a.m. until one hour before sunset. Monday closed. Admission € 6,00. 7 days ticket also including Villa of the Quintili and the Baths of Caracalla. Fabulous! I love the idea of seeing this by bike. Thanks for a terrific post! Mmmh, sounds like Destiny is telling you something… To come to Rome and ride on the Appian Way!